Practice under the pressure of working on real people/animals, experiencing the influence of human factors on hands-on and interaction skills, while developing situational awareness - with ReaLifeSim and VetReaLifeSim. 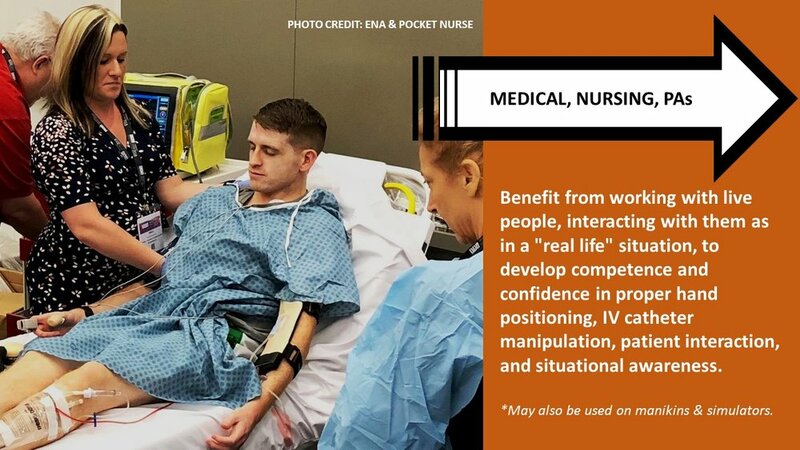 ReaLifeSim provides a high level of physical fidelity, while providing the opportunity to relate to a “patient” on a human level - exactly what’s needed for developing health care professions learners. Working with ReaLifeSim and VetReaLifeSim, learners & providers safely practice hands-on clinical skills on a live person or a live animal (veterinary care), relating to them as they would in a real-life situation, promoting an emotional connection and a heightened sense of “presence” contributing to improved situational awareness. Wearable ReaLifeSim Hybrid IV Trainer. 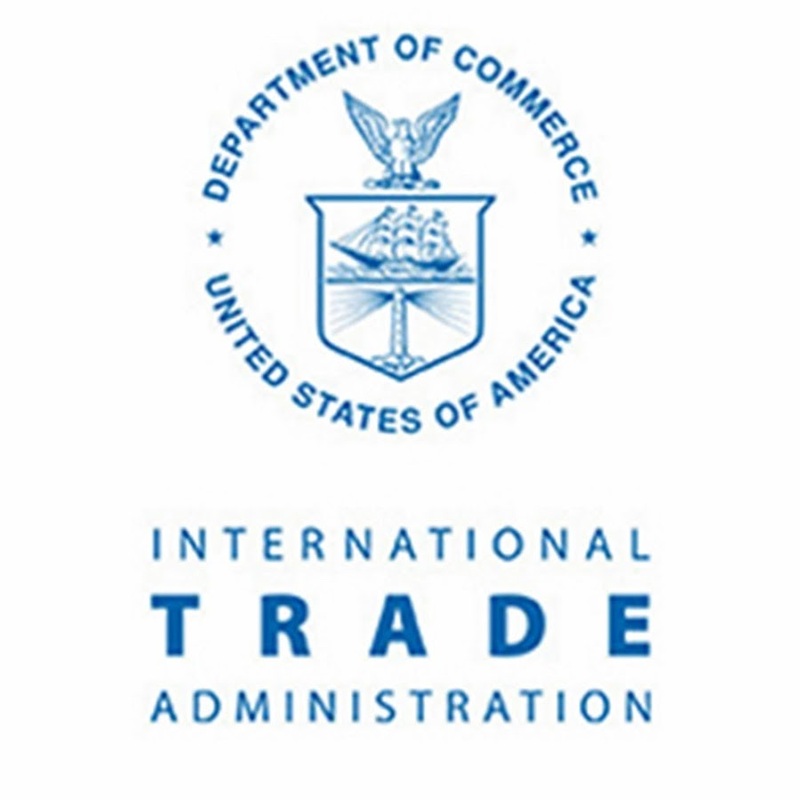 Used in any environment to develop proper hand positioning, IV catheter manipulation, patient interaction, and situational awareness. Easy setup and no-mess cleanup. After working with ReaLifeSim, learners and providers report improved clinical competency, more clear communication skills, confidence, and deeper empathy - which contribute to reduced preventable medical errors, reduced time to treatment, and minimized human factor mishaps. After working with VetReaLifeSim, learners and providers report an improvement in the completion time and accuracy to start an IV or draw blood, as well as heightened confidence to perform these skills and handle the animals. ReaLifeSim used with Lifecast Body Simulation Ltd and iSimulate emphasizing the importance of replicating real-life in clinical skills training. These providers started an IV and giving meds through ReaLifeSim wearable IV training products, just as they would in a real-life situation. ReaLifeSim & VetReaLifeSim IV trainers address both physical and emotional simulation components, providing safe practice for hands-on skills to develop and maintain a level of competence, while simultaneously relating to the “patient” in a way that communicates confidence and inspires trust from the patient. ReaLifeSim & VetReaLifeSim are routinely worn by real people and real animals to encourage team and provider-patient communication, but can also be used as an "add-on" to manikins and simulators to enhance function and extend sustainability. 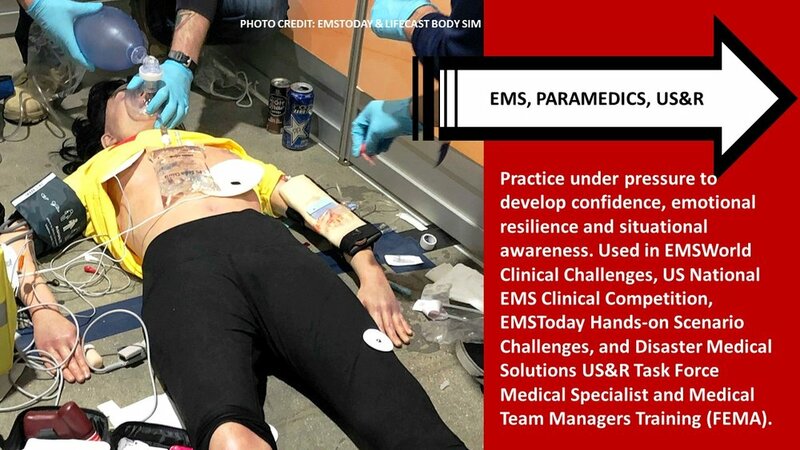 By safely practicing essential hands-on skills and interacting with their “patients” as they would in a real-life situation, students and professionals develop and maintain competence and confidence through effective and efficient learning experiences. These improved skills competencies decrease time to treatment, improving patient experience, safety, and outcomes. 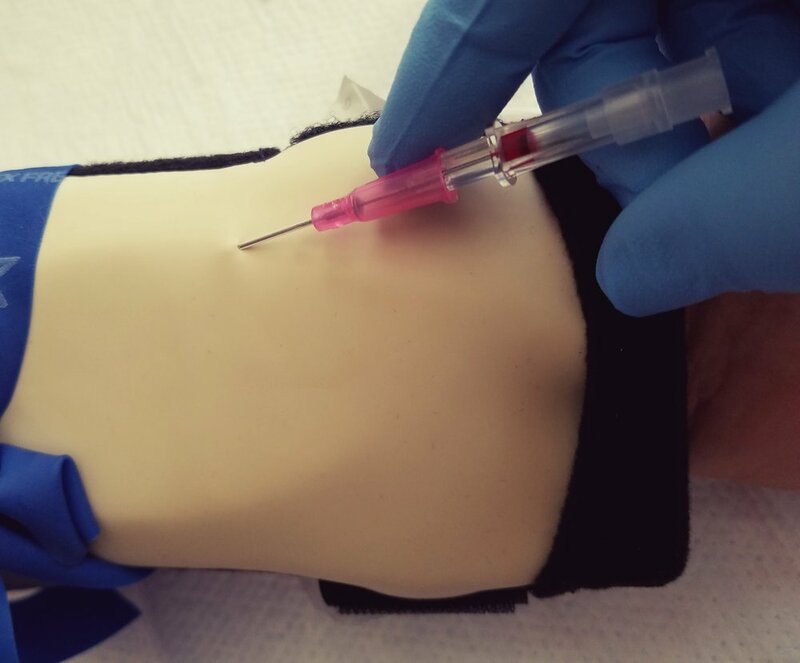 The “Advanced Version” of ReaLifeSim & VetReaLifeSim IV Trainers were designed to help the learner and instructor “see” what’s going on beneath the skin with insertion attempts. We embedded sensors to identify IV catheter or needle insertions that go beyond the depth of the vessels, which is a patient safety concern. Using the ReaLifeSim App for this combined skills performance tracking, the learner can review a report of their hands-on skills performance, plus audio recordings of their provider-patient interactions on their mobile devices in four languages: English, French, German and Spanish. These are used in Objective Structured Clinical Examination (OSCE), Competency-based Training (CBT), and Competency-based Assessments (CBA). Patient Safety - "The Focal Point of Patient-Centered Care"